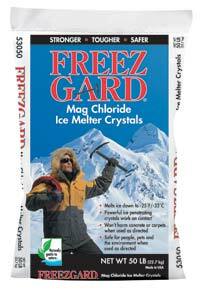 FreezGard Mag chloride ice melter crystals melt ice and snow at temperatures as low as –25 degrees Fahrenheit. It leaves no slick oily residue and it’s safe on vegetation, concrete and people. Plus, the unique crystal shape means rapid ice penetration and exceptional scatter control.